Warming up today with this pumpkin beer broccoli cheddar soup. Did I happen to tell you guys that it totally snowed here on Sunday night? Yes, SNOW. We’ve had snow on the mountain tops for the last week, but Sunday night it actually snowed, hit the ground, and stuck. Meaning, the white stuff was on the ground when I went for my morning hike. Typical. I know we are way ahead of the game over here, but I’m hoping you guys are in warm soup mode too! Ever since this weekend I’ve been left craving a giant bowl of soup, so I thought today would be the perfect day to tell you all about my newest broccoli cheddar creation, PUMPKIN BEER broccoli cheddar soup. Sorry for the shouting, but I’m just so excited about this soup. 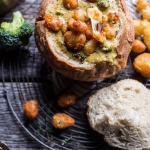 It’s warm, cozy, creamy, loaded with broccoli, cheesy, and flavored with the most delicious hints of sweet pumpkin. Basically, it’s October Soup. And yes, I know it is still September, but October is coming this weekend (how is that even possible?) and I think this soup should be on your to-make list. Just sayin’. 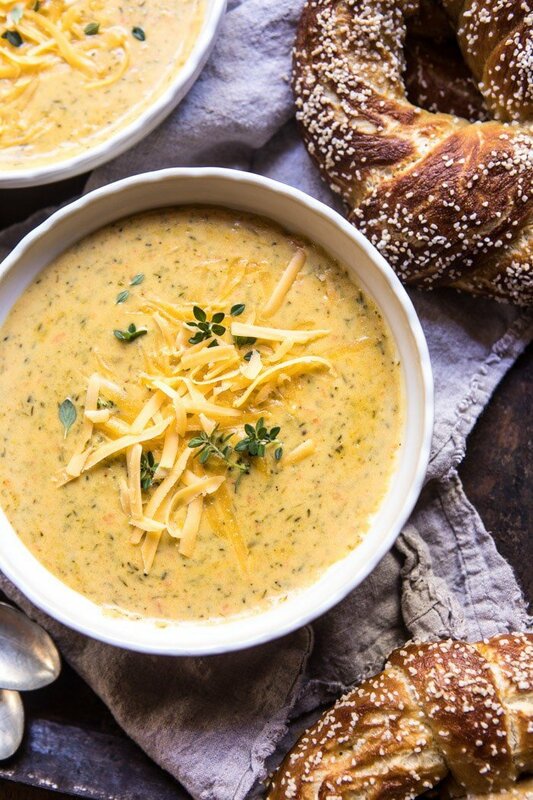 See, I love broccoli cheddar soup, but then what’s not to love? 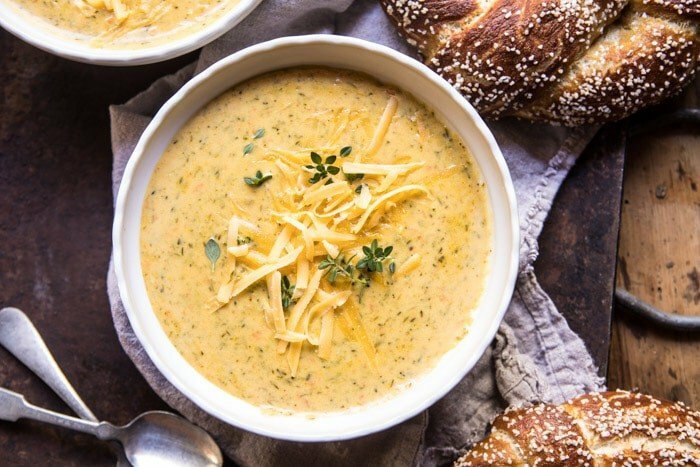 It’s got your veggies, your cheese, and is the perfect soup to serve during the month of October, which typically starts to see a frost…or maybe even some snow…AKA soup weather! Alright, so what makes this soup better than all the other broccoli cheddar soups out there? 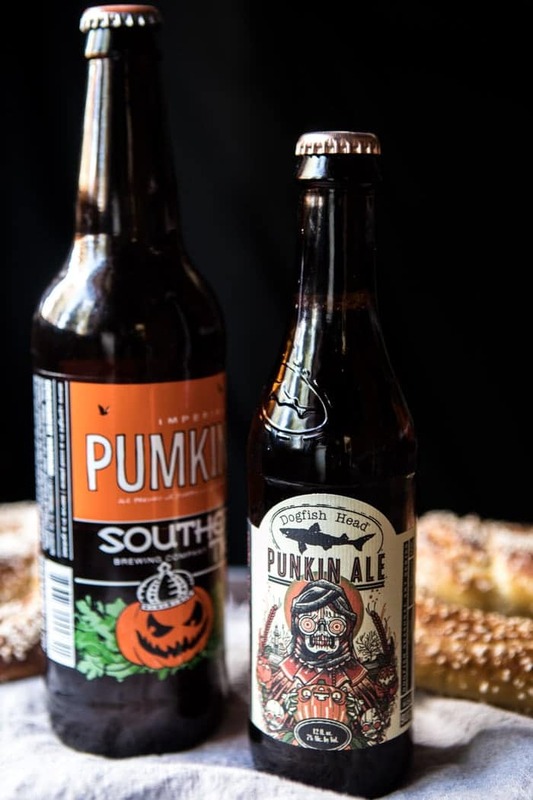 Um, the pumpkin beer…obviously. I know it may sound a little odd to add a pumpkin beer to a creamy broccoli cheddar, but the pumpkin beer’s warming tones add so much to this creamy, cozy soup. 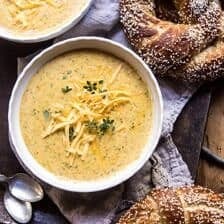 Just trust me, you will not be disappointed, and like all other broccoli cheddar soup recipes, this one is pretty easy. Just one pot and ready to go in under an hour. Plus, I think we might even be able to get away with calling this healthy…ish with all the green broccoli in there. I mean, broccoli is one of they healthiest veggies out there. Just go with it…and while you’re making the soup, may I recommend making a batch of these pumpkin beer soft pretzels? 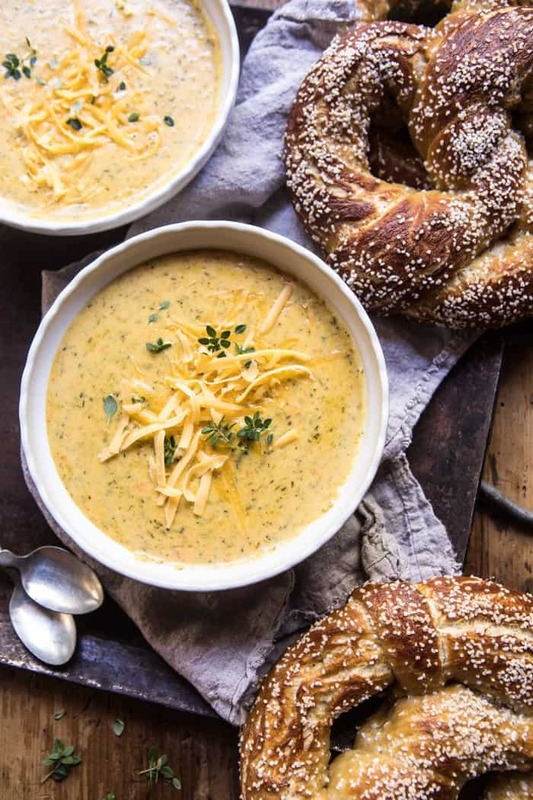 Not going to lie, there’s no better bread to pair with this soup than these pretzels. This is simply the best combination. Oddly today I am headed out of the cold and on my way to Los Angeles where it is a high of eighty-five degrees. Ahh, totally not soup weather, but I’m excited to be heading out to LA for some fun cookbook press! I’m taping an episode of Hallmark Home and Family tomorrow that will air this Friday. So be sure to tune into that. I will be making my Nonnie’s Dutch Baby from the Half Baked Harvest Cookbook. Pretty excited! Then on Friday I’m working on a special project with My Domaine that I can’t wait to tell you guys all about. Follow along with me on Instagram to see some behind the scenes! Heading home Friday night, but let me know if there is anywhere in LA I should eating at over the next few days! 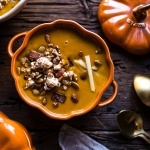 For now, I will just be sitting on a plane, dreaming about this pumpkin beer broccoli cheddar soup! Again, you guys have to make this soup. It’s going to make your day so much better. It is delicious…especially with a side of these pretzels. 1. Heat the olive oil and butter in a large pot over medium heat. When the oil shimmers, add the onion and carrot and cook until fragrant, about 10 minutes. Whisk in the flour and cook until golden, about 2 minutes, then gradually whisk in the milk until smooth. Add the broth, beer, broccoli, bay leaves, nutmeg, cayenne, and a large pinch each of salt and pepper. Bring to a simmer, reduce the heat to medium and cook, uncovered, until the broccoli is tender, about 20 minutes. 2. Remove the soup from the stove. Remove the bay leaves and puree in batches in a blender or use an immersion blender. 3. Return the soup to the stove and set over low heat. Stir in the cheese until melted and creamy. Add the thyme and cook another 2-3 minutes. Taste and adjust seasonings as desired. 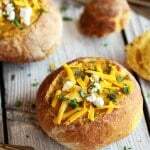 Laddle into bowls and top with a little extra cheddar and fresh thyme. Enjoy! And again, there’s broccoli involved, so you know, healthy…ish. 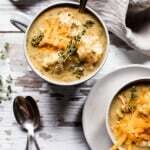 Broccoli Cheddar Chicken and Dumpling Soup. 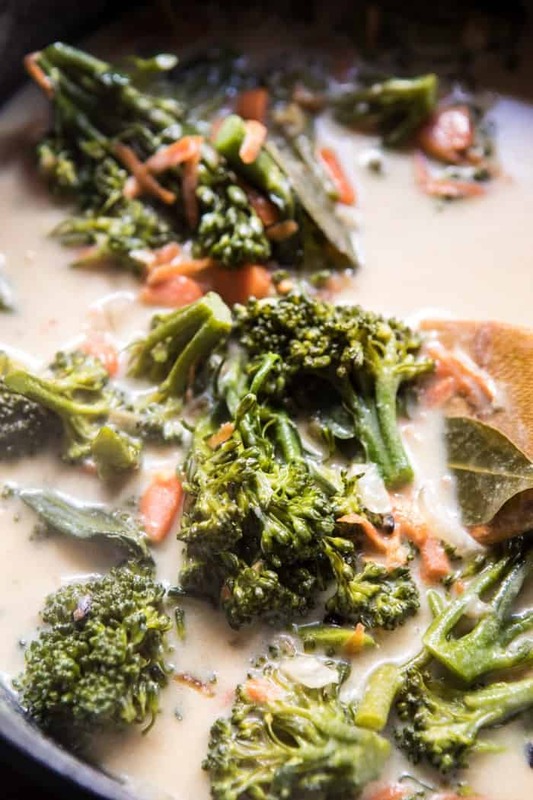 I love love love broccoli soup, am sooooo making this one!!! Thank you Ruth! I am sure you will love this! The soup looks perfect, I’ll eat anything with cheese, lol. Haha me too! I hope you love this! YES! I am so glad you are liking this! Thank you Kelsey! Pumking is way too good for soup! It’s my favorite pumpkin beer. I can’t believe how popular it’s become in recent years #ilikeditbeforeitwascool haha. This recipe looks AMAZING! But we’re currently hitting record highs in NY. I can’t wait for the cooler weather. It’s suppose to cool down this weekend I think. Thank you Elise! I am so glad you like that beer & I hope you love that soup! Send some snow here!!!! I literally CANNOT WAIT until it is cold enough for snow!! 🙂 And send some of this soup too, pretty please!? 😉 Hugs, Tieghan! Haha I totally would if I could!! I hope you like it if you get a chance to make it Sarah! Thank you! wow, just gorgeous, and snow? Well this is certainly comforting, love the pumpkin beer, even the pumpkin pretzel, it all fits and just in time for Oct, thank you for all! SO glad you’re loving this! Thank you Sabrina! This soup looks amazing, but unfortunately I can’t have any alcohol. What would you recommend I substitute the beer with? Water or just add more broth? I really want to try the recipe since I love broccoli cheddar soup. Thanks Teighan and I hope you enjoyed LA! Hi Sarah! I would use 1 1/3 cups chicken broth or apple cider for a sweeter option. Thank you! Oooohhh, those two magical words … apple cider!!! I love broccoli soup and was given the Panera Bread recipe this year which is amazing. I can not wait to try your recipe. I assume the recipe for the pretzels is also on this site; that is another recipe that I have searched for. 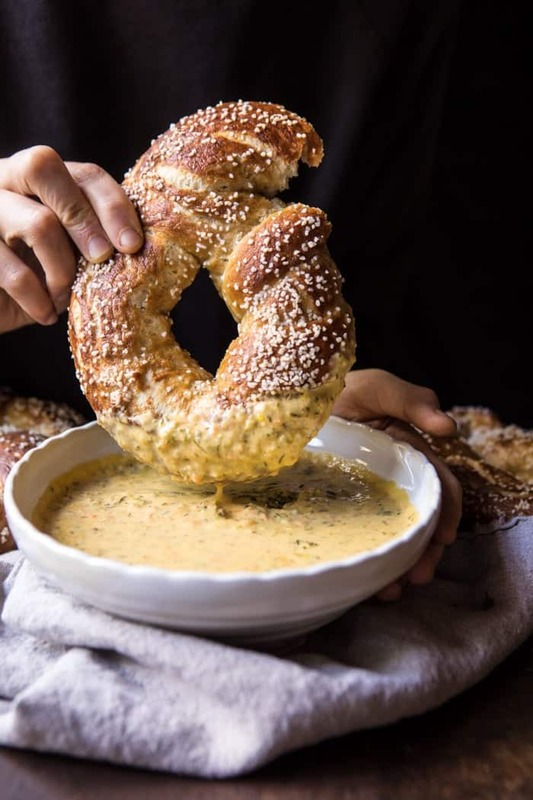 A small restaurant in Winfield, Illinois called Gnarly Knot makes homemade pretzels from her grandmother’s recipe and each day a different pretzel and home made soup are featured. I just can’t make it over there so I am so grateful to find a yummy pretzel recipe. Thanks! PS I am going to use gluten free flour. I am a raw food chef but soup is so comforting! 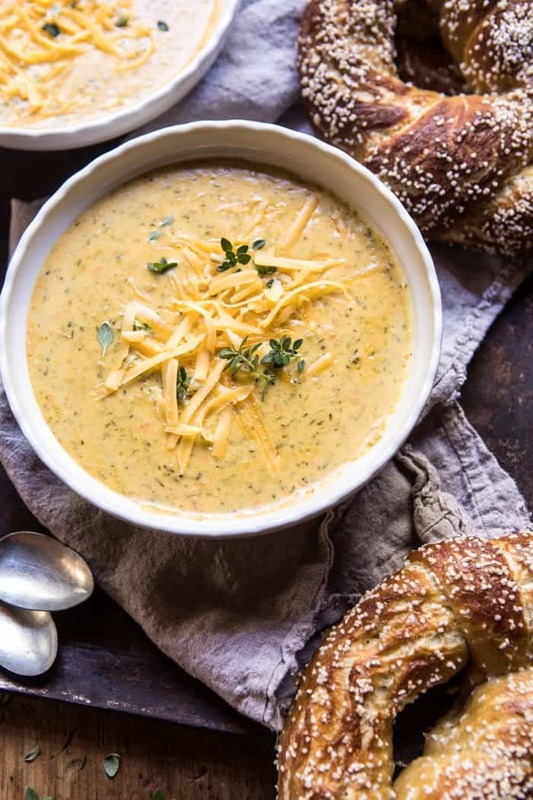 The perfect fall soup, especially with that side of pretzels — so much yes! Haha so happy you love this! Thank you Kim! 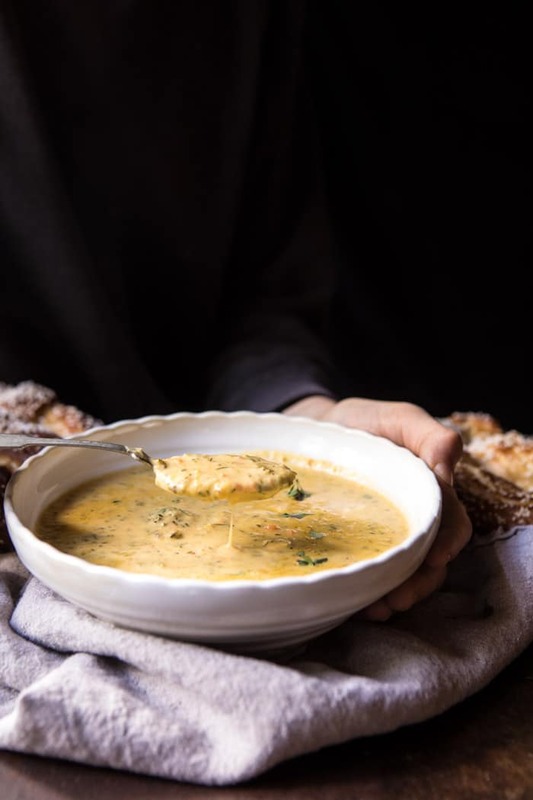 This was an absolutely delicious vegetarian option for soup Monday (all fall and winter at our house) and very simple to make. I made homemade bread to go with it – first time in a long time, and it was exactly what I wanted. Thanks for a great recipe! That is so great to hear! Thank you Vivian! Looks amazing!! Any thoughts on how to adapt the recipe for a slow cooker? I would just add all ingredients to the crockpot and slow cook for 6 hours on low. Mix the flour with water to create a paste before adding to the slow cooker. Let me know if you have other questions. Hope you love the recipe. Thank you! I read the comment about what to add if you don’t use alcohol. If you sub in what you suggested, does it need something pumpkin-y? Never had pumpkin beer so I wasn’t sure what that added to the soup. If you are feeling healthy-ish in LA, or recovering from not being healthy-ish in LA, you must eat at Cafe Gratitude, Venice Beach! Great food and mood! Great!! Thank you for the suggestion Barbara! I will let you know if I make it there! Thank you so much Leah!! I hope you love the pretzels! Oh my gourd this looks damn good! This was delicious; you can really taste the pumpkin beer and I mean that in a good way. FYI I only had 1% milk and was too lazy to go out for whole, and the soup still turned out great…rich with a nice velvety texture. It’s a winner! That is so great! Thank you Sam! I just made this soup and LOVED it! I do have a question, though. Are you supposed to remove the bay leaves first before pureeing? My husband and I found crunchy pieces of the leaves in our soup, and let’s just say, it was a little painful later… haha! This is comfort food at its best! Do you think I could successfully substitute an Oktoberfest for the pumpkin ale? Hey there! Any other beer recommendations for this soup? All I have is a porter in my fridge! Haha! But this looks amazing! Just made this tonight and it was really yummy! However, it came out very thick, so I might add 1 cup more liquid next time. Also, I subbed unsweetened soymilk for dairy milk and couldn’t really tell the difference. Also added 1/2 the amount of thyme because it seemed like a lot for how much soup it yielded. (About 4 bowls with 2-3 ladle-fulls each. Maybe next time I will just forgo the beer and try 1/2 cup pumpkin puree instead, as I could not really taste the pumpkin. Either way, it was a crowd pleaser and enjoyed on the first day of real fall here in LA! Thank you! I am really glad you liked this Melissa and hope it turns out even better for you next time! Thank you! Hi! Excited to make this but don’t have an immersion blender. Do you have one you recommend? Tieghan I fell in love with the pumpkin shaped pot you used in this video! Would you please tell me where you got it from?? Recipe looks amazing as always! Hi Gabby! Here is the link. It is a Staub pot! This was the 4th recipe that we made from your siteand as always, you knocked it out of the park! So tasty and perfectly nourishing on one of the first chilly nights of the season. We’ll definitely be making this one again and again! I am so glad to hear that! Thank you so much Aimee! I am so glad this turned out so well for you and you enjoyed it Lexi! Thank you so much! Can you recommend gluten free option for the flour, would love to make this but cannot have flour? This soup is delicious. It’s now my go-to for broccoli soup. I am so glad to hear that! Thank you so much Danica!